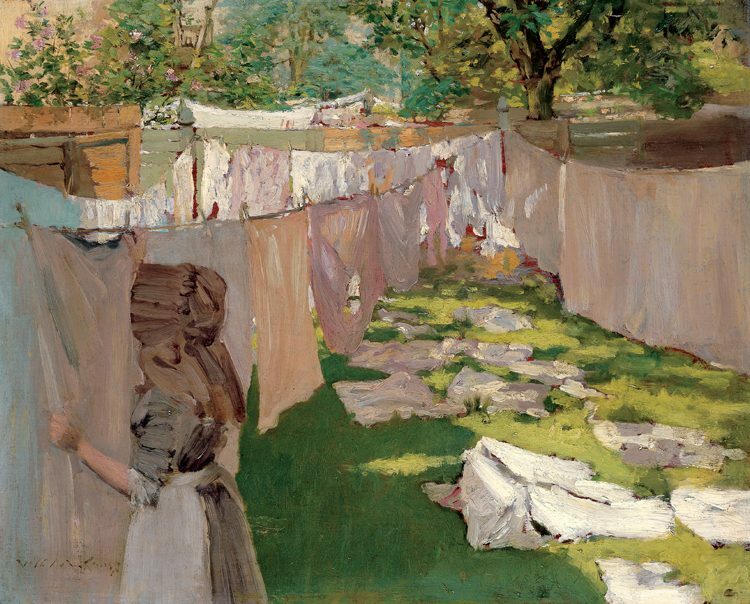 William Merritt Chase, Washing Day—A Backyard Reminiscence of Brooklyn, c. 1887. Oil on wood panel, 15 1/4 x 18 5/8 in. Collection of Lilly Endowment, Inc.
During the 1880s, William Merritt Chase became active in New York’s artistic avant-garde through his affiliation with two progressive arts organizations: Society of American Artists (president 1880–81; 1885–1895) and the Society of American Painters in Pastel (co-founder, 1883). A natural-born orator and marketer, Chase led the charge of a younger generation of American artists determined to transform their country’s provincial cultural landscape by introducing a new modern spirit in American art. While continuing to work from his Tenth Street studio, the artist increasingly turned his eye and brush to capturing nature’s passing beauties. 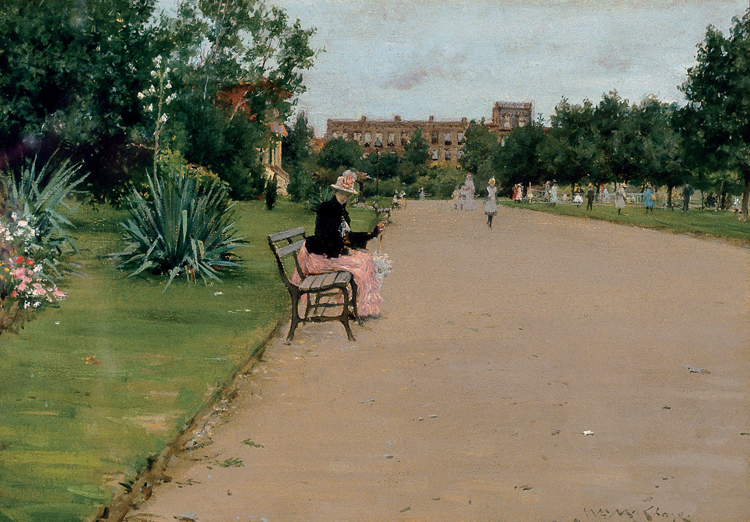 Regular visits to Europe between 1881 and 1885 inspired him to investigate the varying effects of natural light and atmosphere in plein-air paintings in oil and pastel. In the Netherlands during the summers of 1883 and 1884, Chase produced several works that capture the region’s cool, moist light cast upon its coastline or grassy terrain. 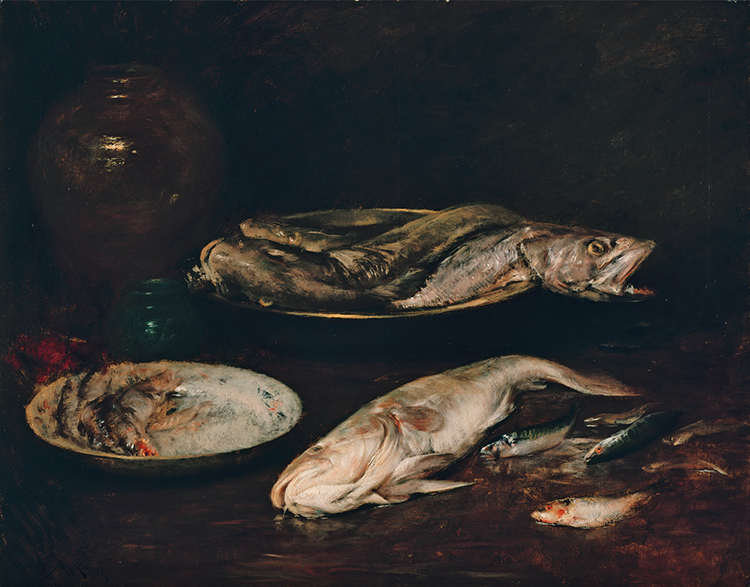 To translate the brilliant effects he observed, the artist lightened his palette and loosened his brushwork, turning away from the loaded brush and dark colors of the Munich style. A devoted pastel painter, Chase began to exploit the possibilities of the pastel medium to further expand his technical and expressive range. By 1887, after several summers abroad, Chase settled in Brooklyn with his new wife, Alice Gerson, where he discovered new aesthetic possibilities in the urban parks and coastline in and around Brooklyn and Manhattan. Carrying small panels and a portable easel, Chase worked with ease to capture the immediacy of his surroundings in dazzling strokes of color. These small jewel-like pictures of Tompkins, Prospect, and Central Parks marked a dramatic turn in Chase’s development of his own distinctly American Impressionist style. Boldly executed, the compositions prefigured the light-filled Shinnecock landscapes that defined his work in the following decade.